Israeli soldiers abducted, on Wednesday at dawn, fifteen Palestinians, including one woman, from their homes, in several parts of the occupied West Bank. 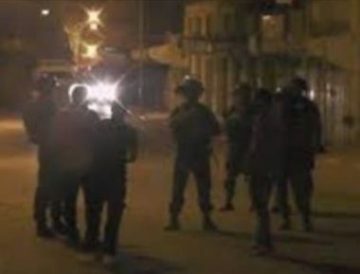 The Israeli army said a grenade was hurled at the soldiers from a speeding car, while the army was invading and conducting searches of homes and property, in the al-Jalazoun refugee camp, in Ramallah, without leading to casualties. Furthermore, the army said its soldiers located a pistol, during searches in Ethna town, west of Hebron. The soldiers also abducted a Palestinian woman, an author identified as Israa’ Khader Lafi, from her home in Surif town, northwest of Hebron. The soldiers carried out extensive and violent searches of many homes in the town, in addition to Beit Ola and Yatta, west of south of Hebron, and installed many roadblocks on roads leading to Hebron and several surrounding towns. Mo’tasem Jawad Abu Alia, al- Mughayyir, Ramallah. Mohammad Abed Abu Ali, al- Mughayyir, Ramallah. Israa’ Khader Lafi, Surif, Hebron. Mohammad Sameeh Ghneimat, Surif, Hebron. Mohammad Haitham Khatib, Qalandia refugee camp, Jerusalem. Mohammad Nasser Mohsin, Abu Dis, Jerusalem.